A few days ago David found out about a new book coming out about Jefferson Texas. When he asked around about the book not many seemed to know about it. Tonight after talking to Mitchel Whitington; our neighbor and local author who confirmed the new book we looked it up on Amazon and found that it will be coming out next spring, you can pre-order if you’d like. The book is called Antebellum Jefferson Texas. Founded in 1845 as a steamboat port at the entryway to western markets from the Red River, Jefferson was a thriving center of trade until the steamboat traffic dried up in the 1870s. During its heyday, the town monopolized the shipping of cotton from all points west for 150 miles. Jefferson was the unofficial capital of East Texas, but it was also typical of boom towns in general. For this topical examination of a frontier town, Bagur draws from many government documents, but also from newspaper ads and plats. 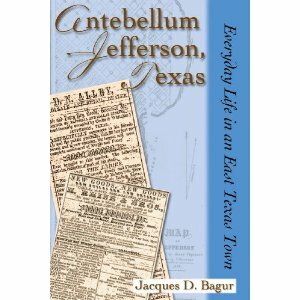 These sources provide intimate details of the lives of the early citizens of Jefferson, Texas. Their story is of interest to both local and state historians as well as to the many readers interested in capturing the flavor of life in old-time East Texas. The author Jacques D. Bagur is an independent researcher specializing in the history and geography of Louisiana and East Texas. He holds a degree from LSU and has spent more than thirty years in applied public policy research. The author of UNT Press’s A History of Navigation on Cypress Bayou and the Lakes, he lives in Baton Rouge, Louisiana. Printed by the University of North Texas Press, look for it coming out February 20, 2012. Some of the great things about Jefferson are that over the years people have bought the old homes here and restored them into a beautiful Jefferson, Tx bed and breakfast like ours and private homes. Some of the homes even offer tours for visitors. This preservation is nothing less than a blessing for the history and future of our town. This entry was posted in Books, History by Tammy D. Bookmark the permalink.